With no money left at the club, the urgent need for a takeover was utmost in the minds of the board during the summer. There were three options they were considering. Francis Lee had proposed that City should sign a deal with Galileo, who were an American hedge fund, who would then spend three months trying to find a buyer in USA. The second option was an offer from a consortium headed by former City defender Ray Ranson. The third was from former Primeminister of Thailand, Thaksin Shiniwatra and despite accusations of corruption charges against him in Thailand the board decided on Shinawatra’s bid, and althogh the deal stalled slightly due to him having his assets frozen in Thailand, a deal finally went through on 21st June 2007 with an £81.6M buyout. 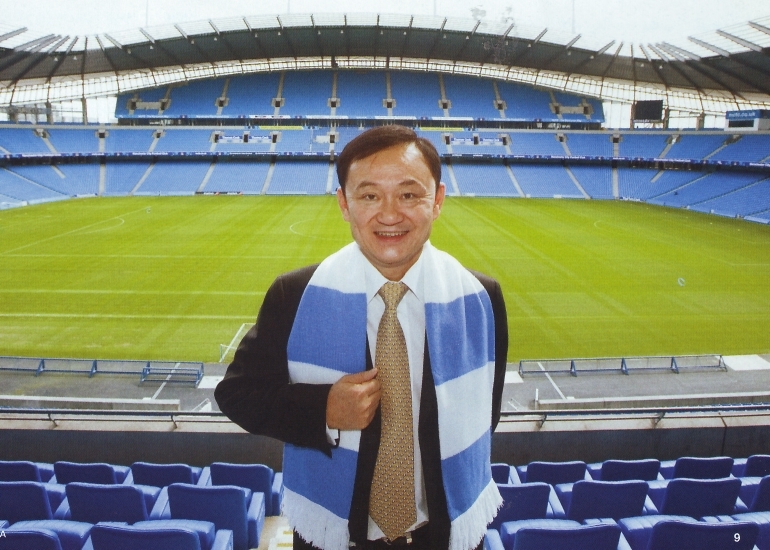 And with just a few weeks until the start of the campaign Sven-Goren Eriksson was announced as City’s new manager to bring some success to City with Thaksin’s three year plan. Rolando Bianchi, Martin Petrov, Geovanni, Gelson Fernandes, Vedran Corluka, JavierGarrido, Elano Blumer and Valeri Bojinov. And so to the start of the new Premier season and Sven’s team faced their first test at West Ham with 5 new signings making their debuts plus Kasper Schmeichel making it 6 . The blues gave a very impressive performance winning 2-0 and were second in the table come the end of Saturday’s games. And so it moved on to Eastlands, could City keep up the form they had shown at Upton Park and above all could they score their first Premier League home goal since New Years Day 2007. The answer was yes to both as City defeated Derby 1-0 in a very impressive second half display. And so with 6 points from a possible 6 it was a real test for City as Manchester United visited COMs only to be put to the sword by a brilliant defensive display by Micah Richards and Richard Dunne. The only down side to the game was news of a cruciate injury to Valeri Bojinov that will see him miss most of the season. The fourth league game of the season saw a visit to the Emirates where Arsenal dealt City there first defeat, however with 9 points from 12, City were now in 2nd place just behind Chelsea. It was time to shuffle the pack as Sven made 8 changes when The Blues visited Bristol City easing through to the Carling Cup 3rd Rd with a 2-1 win setting up a home tie against Norwich on 25th September. And so back to the league and it was a 2nd consecutive 1-0 defeat this time at the hands of Blackburn at Ewood Park. A two week break for Internationals brought City their first awards of the season as Micah Richards received The Barclays Premier League Player of the Month award for August for his fantastic appearances for both City and England and Sven quite rightly was awarded Manager of the month award for August as he proved all doubters wrong, leading City to four victories out of five games in his first month in charge. With all players back fit from their International duties it was back to winning ways in the Premier League as City saw off an in form Aston Villa outfit with a 1-0 victory. 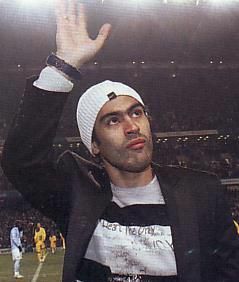 This was to kick off a 6 game unbeaten run. The blues earned a draw in a six goal thriller at Fulham and then in a team which contained 8 changes City marched on to the fourth round of the Carling Cup with another 1-0 home victory over a brave Norwich side. City had been playing some very attractive football at home with Elano the man pulling the strings in midfield, and although there had been plenty of chances made it was extraordinary that the Blues had only managed 4 goals in total in their 4 home victories. Newcastle United were the unlucky team to concede more than one goal at the COMs as City put up their beat display of the season so far with a 3-1 win on the last Saturday of September, with the blues standing 3rd in the league. Middlesbrough were the next team to face the wrath of Elano as he scored 2 sensational goals in another 3-1 victory. With another 2 week International break some of the players looked a little jaded on their return and although it wasn;t the best performance of the season City made it 7 wins out of 7 at Eastlands as they beat a hard working Birmingham team 1-0. This was the best start to a season by City since 1971 and they had 22 points from 10 games, the fans were starting to talk of a top six place as the minimum to gain from the season. Who could have imagined then that a week later City travelled to Stamford Bridge and were swept away in a disastrous 6-0 defeat by Chelsea .. Not the best preperation for the Carling Cup 4th Round tie at The Reebok, however a shell-shocked City side pulled it back together with a 1-0 win over Bolton setting up a Quarter Final clash with Tottenham. City got back to winning form in the league as well as they beat Sunderland 1-0 although probably the least impressive home game of the season the Blues were still in 3rd position on 25 points as they entered November. An impressive display against top six side Portsmouth saw City gain a good away point in a goalless draw, then it was back to Eastlands and City kept themselves in the top four with a 2-1 win over Steve Coppell’s Reading keeping up City’s 100% record at home. There were still concerns over City’s away form and they faced a tough match at Wigan next without injured Brazilian ace Elano. A Wigan side inspired by new boss Steve Bruce almost took all the points and City were happy to go home with a 1-1 draw. They were not as lucky when they visited White Hart Lane a week later when they were beaten 2-1 by Tottenham Hotspur. However at home the Blues were setting new records as they made it 10 wins out of 10 in all competitions with a 4-2 win over Bolton . City then faced a Tottenham side for the second time in nine days as they met at Eastlands in the Carling Cup Quarter Final, and even with Elano back in the side they were unable to exact their revenge for the away defeat and were knocked out 2-0 by the London outfit, there was some good news, however for the City faithful as £15 Million pound rated Mexican ace Nerys Castillo was paraded on the pitch prior to the game. Sven had managed to broker a 1 year loan deal with Shaktar Donesk with Castillo so anxious to join City that he paid most of the loan fee out of his own pocket. The Mexican forward would be available for selection in 2 weeks time once the January transfer window had officially opened. The Blues were unbeaten over the Christmas period as they drew 1-1 at Aston Villa . 2-2 at Eastlands against Blackburn and then put up a great defensive dispaly again at Eastlands to hold off Liverpool in a 0-0 stalemate. City had not won away in the league since the first day of the season however all that changed in the first game of 2008 as they travelled to St James’ Park and completed a double over Newcastle with a 2-0 win. The Blues made it three clean sheets on the run three dys later as they earned a replay in the F.A. Cup 3rd round drawing 0-0 at West Ham. City then met an Everton side challenging them for one of the end of season European spots and it was Everton who came out on top winning 1-0 at Goodison Park. City now sat in 7th place in the Premiership however they and the 3 teams above them all had 39 points. 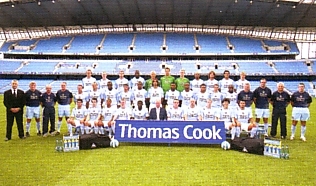 West Ham travelled to Eastlands four days later for the F.A. Cup 3rd Round Replay and a single goal from Elano saw City in to the fourth round however there was some bad news as Castillo making his home debut fell awkwardly in the first half and cracked a small bone in his shoulder meaning he will be out of action for approximately six weeks. The Hammers were back at Eastlands four days later for a League game and an under performing City side were lucky to gain a point against West Ham in a 1-1 draw leaving City seventh in the Premiership. A trip to Sheffield United in the FA Cup 4th Round saw City dumped out in controversial style with a goal which owed more to balloons on the pitch than players. City then travelled to Derby and young Daniel Sturridge scored his second goal in two games rescuing a point in a 1-1 draw. 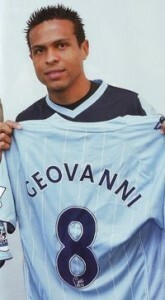 On the day of the transfer deadline City were involved in an on-off deal to bring Mwaruwari Benjani from Portsmouth. At midnight it seemed City had bought the strker for £9 Million however it soon came to light that certain papers had not been lodged with the FA in time. After days of deliberation the FA agreed that the deal could be ratified but City could re-negotiate the transfer and with Portsmouth anxious for the deal to go through City agreed a fee of just £3.87 Million rising by approximately another £2 million dependant on appearances. Other deals which went through included the signing of another striker, 19-year-old Ecuadorian international striker Felipe Caicedo from FC Basel for a fee of over £5 million. Moves away from the club saw Georgios Samaras move to Celtic on loan, Rolando Bianchi on loan to Lazio, Paul Dickov on loan to Blackpool, Ishmael Miller moved permanently to West Brom in a deal that could see his fee rising to £1.5 Million, finally Ousamane Dabo moved on a free to Lazio. 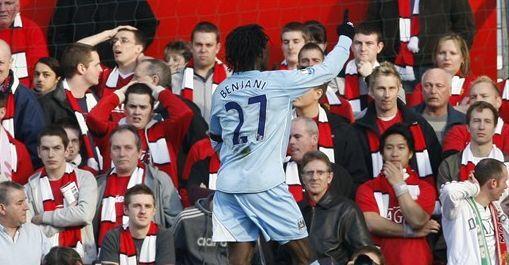 The Benjani deal was not completed in time for Arsenal’s visit to Eastlands and City were put to the sword losing 3-1 and in 7th Place. The next week was fuelled with the media debating how much City fans would dishonour Manchester United ‘s planned remembrance of the 50th anniversary of the Munich air disaster which would take place a week later on 10th February as City visited an emotional Old Trafford. As it turned out it was the perfect Derby day for Manchester City. The fans impeccably respected the minute’s silence remembering the death of City’s goalkeeping great Frank Swift, and then the City players turned in an impeccable performance as they completed the first double over Manchester United since 1970 with a 2-1 win and a debut Derby day goal from the impressive Benjani. Not only did the result give City the bragging rights in Manchester it also moved City into equal 5th with Aston Villa and Liverpool with a two week break ahead as City now had no involvement in the FA Cup. Two weeks after the great win at Old Trafford City were brought back to earth as they were beaten 2-0 at home to European challengers Everton , then they failed to score again at home dropping another two points in a 0-0 draw against Wigan before seemingly putting themselves out of a spot for Europe by going down 2-0 at relegation threatened Reading . And so City lay in 9th position with only the top 5 places automatically qualifying clubs for Europe and 6th place giving a further chance in the Inter Toto Cup it seemed City would have to look to next season for a European place. So with nine games left City gained there first home win in five games as they beat an in form Tottenham 2-1 moving them within two points of the elusive sixth place the Blue’s fans were still hoping was achievable. European hopes were soon checked as City failed to Beat relegation threatened Bolton at the Reebok in a turgid goal-less draw. And then worse to come as a trip to another club fighting relegation ended in a 3-1 defeat to Birmingham . City put up a better display at home to Chelsea but were still beaten 2-0, however another good team performance saw the blues win 2-1 at relegation threatened Sunderland . Away from the first team City’s youngsters made the headlines as Jim Cassell’s Under 18s team beat Chelsea in the 2nd leg of the FA Youth Cup Final 3-1 to take the trophy 4-1 on aggreagate. Back to the senior team and with just four games left City boosted their UEFA Cup qualifying hopes with a very entertaining 3-1 home win over a Portsmouth side which clearly had one eye on their end of season FA Cup final appearance. With The Blues still with an outside chance of Europe and with a top 10 place now guaranteed rumours began to circulate that Thaskin was unhappy with the tail off in form towards the end of the season and although Sven had reached Thaskins first season target of 10 place or above the media were speculating that Sven would not be City’s manager next season. City’s European hopes faded when they were beaten 3-2 by relegation threatened Fulham in the last game of the season at Eastlands, where the fans were fully behind Sven unbelieving that he would not be the ‘gaffer’ next season. 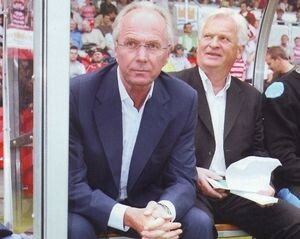 Unfortunately the rumour mill was now in full swing and all Dr Shinawatra would say on Sven’s future was that his position would be reviewed at the end of the season and that all he could confirm was that Sven would be taking the team on the end of season tour to the Far East. The Blues were then beaten by a solitary goal at Liverpool where the City faithful showed further support for Eriksson by wearing Sven masks, however by the time City played their last game of the season at Middlesbrough it seemed that Sven’s position at City was becoming untenable as he admitted in the press that he himself did not know if he would be at the club next season as he could not open any dialogue with the Thai owner. This uncertainty may have affected the team on the pitch at the Riverside as Middlesbrough inflicted an embarrassing 8-1 win over a demoralised City side. And so the season was over and City finished 9th on 55 points and although they missed out on a European place via their position in the league, lady luck shone on the Citizens as they gained a UEFA Cup place via the debacle that is the Fair Play League. 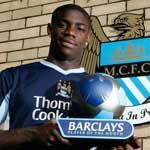 Richard Dunne was named City Player of The Year and Sven flew out with the team to Thailand where an inexperienced City side lost 3-1 to The Thai League Allstars before flying to Hong Kong where they lost to a South China Invitational XI again 3-1, with Thaksin donating City’s match fee to the China Earthquake Fund. 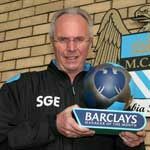 Sadly Dr Shinawatra was not as charitable with Sven though as on the 2nd June 2008 he announced that Sven would be stepping down as City manager. With much speculation as to who would be Sven’s replacement, two days after Eriksson’s departure it was announced that Mark Hughes had signed a three year contract to take over at Eastlands and plot City’s European adventure in the 2008/09 season. This entry was posted in Latest and tagged 2007 to 2008, Latest, News by boswell. Bookmark the permalink.